Day 2 Kuala Lumpur: On arrival you will be met and transferred to your hotel. At leisure for the rest of the day. 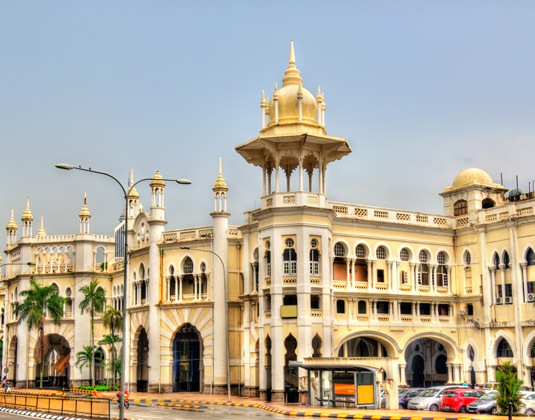 Day 3 Kuala Lumpur: During today's city tour see fine examples of Colonial and Moorish architecture, including the Sultan Abdul Samad Building opposite Independence Square, the Selangor Club and the Railway Station. Other highlights include the serene Jamek Mosque and a drive past the majestic Royal Palace, into Lake Gardens where the National Monument is located. Stop for lunch at a restaurant operated from a colonial bungalow before visiting the Central Market where you may chance upon local artists at work among the many souvenir stalls. Day 4 Kuala Lumpur/Cameron Highlands: Travel by road to the Cameron Highlands, a former weekend retreat for the British during colonial rule. On arrival this afternoon enjoy a tour of BOH tea plantation owned by the Russell family (approx 133 miles/4 hours drive). Day 5 Cameron Highlands: Morning tour of Cameron Highlands with visits to a market, vegetable farm, flower gardens, tea plantation and Sampo Temple. The afternoon is at leisure to relax or, you could perhaps take high tea at Scottish Ye Old Smokehouse or play a round of golf (both additional expense). Day 6 Cameron Highlands/Penang: En route to Penang stop at Kellie's Castle, a pre-war ruin of colonial influence and Pasir Salak where the original flames of Malay nationalism began and the First British resident of Perak, JWW Birch, was assassinated. You will also visit the oldest museum in Malaysia, before driving through the Lake Gardens and Allied War Cemetery. Continue with a drive across one of the two Penang Bridges, which are among the longest in Asia (approx 177 miles/4 hours drive). This evening, you may wish to book an optional Georgetown by Night excursion (additional expense) which includes the chance to savour many famous Penang local dishes at one of the many open-air food stalls. The tour also includes a trishaw ride through the heart of Georgetown. Day 7 Penang: Visit some of the most outstanding historical remains of Georgetown - recognised as a UNESCO World Heritage site, including Fort Cornwallis where Captain Francis Light first landed. View significant buildings such as the Anglican Church, the court house, Penang Art Gallery and the Blue Mansion. Proceed to visit Peranakan Mansion to witness the many priceless artefacts of the colonial-Victorian era, followed by a visit to the Christian Cemetery where Francis Light was laid to rest. Ascend Penang Hill by funicular railway, built by the British in 1923. Enjoy lunch at the summit, drinking in the panoramic view of Penang Island. Continue with a brief stop at the Suffolk House, the former residence of Captain Francis Light, then visit the only Colonial Heritage Museum in Malaysia to find out more about early Penang. Finally, visit Penang Botanical Gardens, commissioned during the British rule, to learn about the rare species of floral and fauna while monkeys roam freely in their natural habitats. This evening, you have the option to take dinner at the prestigious Eastern & Oriental Hotel, which was established in 1885 during the spice trade era (additional expense). The hotel stands as a testament to the grand elegance of the British colonial era and its name is synonymous with Penang. Day 8 Penang: At leisure until your transfer to Penang airport for your onward journey. Alternatively, why not extend your stay in Penang? Accommodation: 5* Luxury The Majestic Hotel; 4* The Lakehouse, Cameron Highlands & 5* Luxury Eastern & Oriental Hotel, Penang. Meals: Breakfast. Lunch is also included on days 3, 4 & 6. Tour price: The price shown is based on the best value travel dates in low season and includes international flights, transfers between the airport and your hotels, accommodation, services of an English speaking guide, sightseeing as stated and entrance fees. BOH tea plantation visited on day 4 is closed every Monday and Cameron Highlands can be busy at the weekend so a UK departure Sat-Mon is recommended.